We met at a Halloween party 10 years ago when we were 15 and 17. It started with flowers at work, and from there I was sent on a bit of a scavenger hunt where I had to solve riddles and find clues, ending with him on one knee at our favourite beach when I took my blindfold off. It was perfect. We wanted a relaxed wedding with a bit of a vintage feel. We were very lucky to have a number of pieces lent and given to us including old suitcases that was used for trip from the country to Sydney up to 50 years ago and wooden logs cut on family properties. We also loved being able to show the journey of our relationship through the photos we had on each guest table. 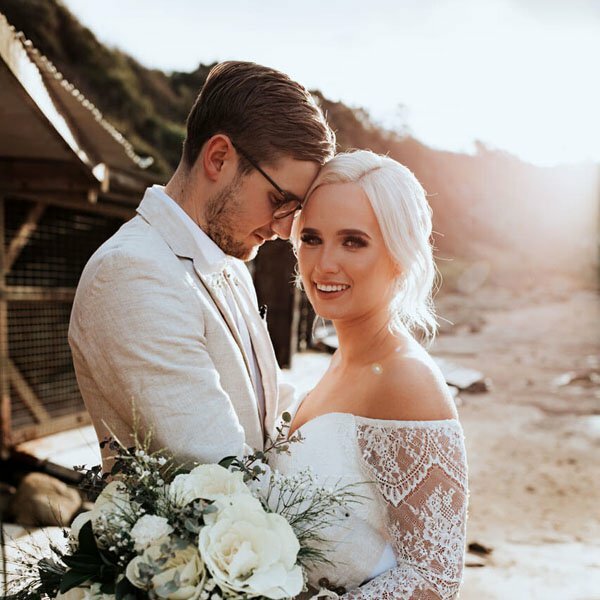 Our ceremony was planned for Flagstaff Hill, however it was raining so we went with our back up option which was inside our reception hall in City Beach Function Centre. It was set up beautifully and the sun cleared enough for us to take photos with our guests on the balcony afterwards with the stunning City Beach, Wollongong in the background. City beach function center offered us the beach wedding Sydney couldn’t. It was the perfect location with the best view, being just far enough away from home to make it special, but not too far to inconvenience guests. Our photos at Sandon Point were a massive highlight from our day. The rain clear, sun came out and then we were left with the most amazing pink sunset for our last couple of shots and drive back to the reception. What was it like dealing with Wedding Coordinator? They were all great! Couldn’t recommend more highly. Wolfie by Golden Features ft. Julia Stone was played immediately after our first dance and brought everyone to the dancefloor. Who was your photographer for the day? Alyce Piazza and her husband from Pure Breeze Pixels – Wollongong locals. All the stress is worth it!